Castlereagh Park has been home to Ards since 1923 and like most other Irish League grounds has been neglected facility wise for many years. 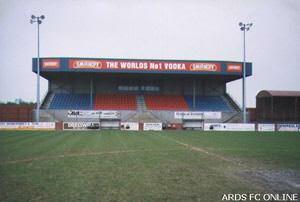 As Ards are due to depart the ground in the foreseeable future for a new stadium close by, certain aspects of the ground are as they once were, however with no perimeter fencing or floodlights, viewing is unrestricted in most parts of the ground. The home supporters obviously have the better deal in terms of view from the ground's only stand, seating just over 500. For any away fans limited covering is provided on the opposite side of the ground. Hot food and toilets are provided at both ends of the stadium, though there is no longer a social club at the ground. For a small fee, parking is available in the club car park and use of this is advisable, as the roadside is often kept clear of parked traffic. Ards Football Club play in the peninsula town of Newtownards, situated at the top of Strangford Lough. Newtownards is one of the largest towns in the County of Down and is easily accessible from Belfast. Castlereagh Park is situated on Portaferry Road heading out of the town and down the peninsula and is one of three football grounds on that road. Take a left at the first roundabout at Ards Shopping Centre, then next right at the lights. Drive right through the town then take a right at the next roundabout and finally a left at the road's end for Portaferry. Go straight ahead at the two roundabouts and take a left for Portaferry at end of the road. Take the first right into Court St. then follow traffic flow before taking the next right heading toPortaferry. Castlereagh Park is on the lough side of the Portaferry Road, next to the abbatoir and facing Londonderry Park. If you are a registered user then you can login, and create your own personal review of Ards - Castlereagh Park. These reviews can be private or public.